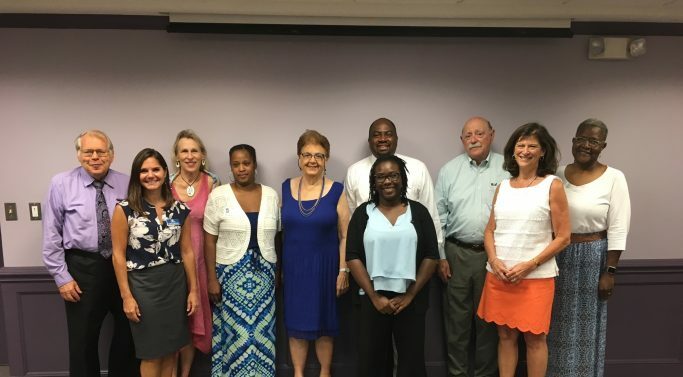 AMC Scholarship Awardees Join Donors & Community Development Leaders for Bagels and Networking - Arundel Community Development Services, Inc.
To support the Ardath M. Cade Scholarship Fund, click here. To apply for an Ardath M. Cade Scholarship award, please check back in late September when the next application round is announced. Janay Brunson, ACDS, Projects Planner- $500 to attend the HUD Basically CDBG training in Atlanta Georgia so that she can provide technical assistance and grants to Anne Arundel nonprofit organizations serving the county’s neediest citizens. Chauncey Hall, ACDS, Program Director – $1,000 to attend the Management Concepts’ Leadership Skills and Techniques course to support his professional development as he manages a team of six to implement housing and financial empowerment programs that serve Anne Arundel County’s low and moderate income households. Jennifer Lagrotteria, Boys & Girls Clubs of Annapolis & Anne Arundel County, Director of Resource Development – $1,000 toward Leadership Anne Arundel’s Flagship program focused on building community knowledge, developing leadership skills, and gaining an understanding of community trusteeship to help better “connect the dots” for BGCAA’s 5 Clubhouses throughout the county. Kameisha Spencer, Community Action Agency, Housing Counselor in Training- $1,000 to attend NeighborWorks America’s Housing Counseling certification program and become a HUD certified housing counselor to both provide housing counseling and eviction prevention counseling. The scholarship award also allowed the Community to leverage other funding and send a second housing counselor to an earlier NeighborWorks training this year. Spring Meadows Council of Unit Owner’s – Up to $500 can be used to reimburse Spring Meadows condominium association board members and volunteers for fees to attend Community Association Institute (CAI) trainings and build the community’s capacity to address community development challenges.